In a TV industry first, Samsung announced that all of its 2016 and 2017 smart TVs can stream PC games via the Steam Link app, which basically renders the $50 Steam Link hardware useless. Instead of connecting Valve’s Steam Link hardware to your TV, you can stream games from your PC to your Samsung smart TV via the Steam Link app, available for free in the Samsung Smart Hub in 55 countries, including the US, the UK and Korea. What is the Steam Link hardware? Alongside a long, a very long list of games, Valve’s Steam has several hardware devices to sell and the Steam Link is one of them. Its purpose is to cater to all the gamers who don’t want to sit in front of their PCs while they’re playing a video game, opting instead to stream the game to a TV and play it from the comfort of their couch, using a Steam Controller. Once you’re done connecting Steam Link to your home network and your TV, it will automatically discover any computer that runs Steam. The computer will run the video game you want to play and stream it to Steam Link which will then display it in your TV. Simple, right? Steam Link is currently priced at $49.99 and €54.99 while the Steam Controller is also priced at $49.99 and €54.99. Getting a Link + Controller bundle will save you 10%, meaning that you’ll have to pay $89.98 or €98.98. It is a software application that replaces the Steam Link hardware, obviously. The app uses the same streaming technology that Valve’s Steam Link hardware uses, allowing you to stream PC games to your TV without having to connect any additional hardware. The Steam Link app was released as a Beta in the US in June. As of August 2017, the Steam Link app has graduated out of Beta and it’s available in a grand total of 55 countries. The app is available can be downloaded for free from the Samsung Smart Hub and it is compatible with all 206 and 2017 Samsung Smart TVs, including the recently released QLED TV line. "Samsung’s 2017 QLED TV models are also highly optimized for gaming. The TVs boast extremely low input and display latency together with the superb image quality of quantum dot technology. Also highly durable, Samsung’s QLED TVs do not suffer from burn-in or image retention issues, even over a prolonged period of game playing," said Samsung in this press release. The Steam Link app provides support for the following controllers: Steam Controller, Xbox 360 wired and wireless, Xbox One wired, and Logitech F510/F710 according to this post in the Steam Link Community. The fact that Samsung is the first TV manufacturer to have the Steam Link application on its smart TVs doesn't really come as a surprise, not when you take into consideration the fact that the company has a long history of TV firsts. .
Samsung entered the TV business back in 1969 and it has constantly introduced game-changing innovations over time. 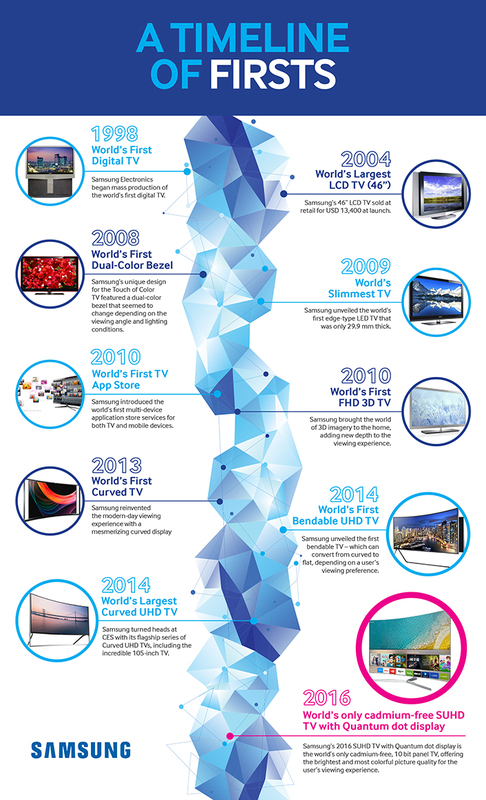 The infographic below goes over Samsung's "timeline of firsts," starting with 1998 and ending with 2016.